This recipe is over 100-years old, and it was given to me by one of my aunts at a bridal shower. 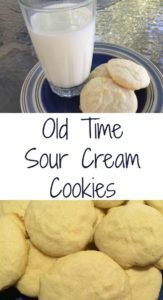 She wrote, “This recipe I copied from my sister Annie’s book in 1927. She got it from our grandma Savilla Miller.” My great-grandma Savilla was born in 1846. Isn’t that unique, to have a recipe that she used way back then? When Savilla made these cookies, she fired up a cookstove. 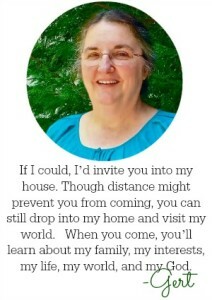 I’ve heard stories about visits she made to her grandchildren after their mother’s death. She carried fresh-baked bread in a basket as she made her trek across the field. On her way home, she picked up sticks and put them in her basket so she’d have kindling for her wood cookstove. Today, I turned my convection oven to 375 and mixed up this batch of cookies. They still taste the way I remember them as a child. Dunk them in milk or eat them with fruit – they have great flavor either way. 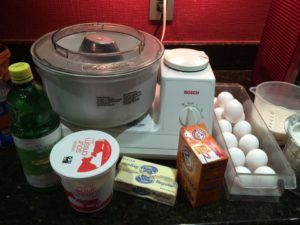 You’ll need the usual cookie ingredients: sugar, butter, eggs, soda, and flour. You’ll also need lemon and sour cream. 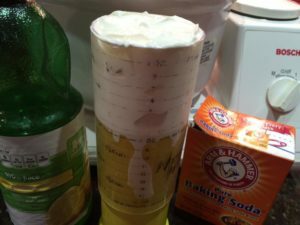 I love my Wonder Cup when I have difficult items to measure – such as mayonnaise, peanut butter, or sour cream. This fits the bill. Move the colander until it is at the correct line and then put your ingredients into the cup. Push the ingredients into your mixer. There is no waste and no scraping. 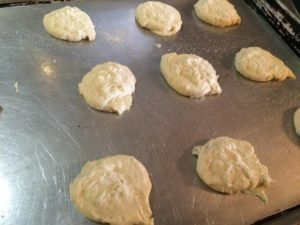 Mix up the batter and drop the dough onto a cookie tray; flatten the cookies a little with a glass bottom dipped in sugar. 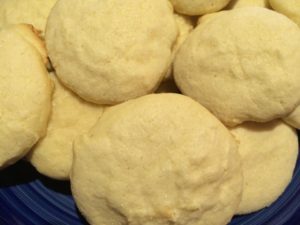 If you want to roll them out and cut them, add more flour. So these could work as a ‘sugar cookie’ that you roll out if you’d like. How long, you ask, is “until done”? Oh, try 8-10 minutes. 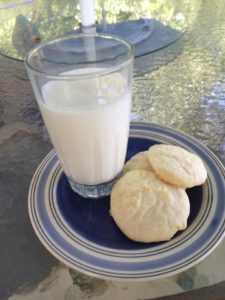 This simple sour cream sugar cookie has a flavor that intrigues. It's easy to mix up and kids will be coming back for more. Looking for ideas for Mother’s day? These measuring cups are the bomb! Remember that Amazon ships free.